The LG Optimus G Pro comes with a wide range of connectivity options. It has quad-band GSM/GPRS/EDGE for global roaming, dual-band 3G with HSPA and 4G LTE for fast mobile Internet. Local connectivity is plenty fast with dual-band Wi-Fi a/ac/b/g/n. The Wi-Fi capabilities also include Miracast wireless display, DLNA, Wi-Fi Direct and Hotspot. Wi-Fi Direct is a technology, which lets devices connect to each other without the need for a Wi-Fi hotspot. The beauty of it is that only one device has to be Wi-Fi Direct-ready for the magic to happen. Using this technology two (or up to eight) devices can share files in a more advanced, fast and secure way, paving the road to the eventual demise of Bluetooth. You can also store information, a profile preset or some action in a blank tag and then use it to make the phone perform an action every time you touch that tag - for instance launch a SatNav app when you touch the in-car tag or change your ringing profile when you touch your designated tag at the office. The Slimport-enabled USB port on the LG Optimus G Pro can be used as a wired TV out. You'll need a dongle (sold separately). The Dual Screen Dual Play feature lets the TV screen and G Pro screen display different things, so you can check Facebook while streaming a movie to the TV or hook up a projector to the Slimport to show presentation slides while reading your notes on the phablet. The USB port has yet another feature - it enables USB On-The-Go. You'll need an adapter for that too (again, there isn't one in the box). The Optimus G Pro has several ways to push out multimedia but it can do more than that - the IR emitter and QRemote app allow it to control your whole multimedia setup, the TV or a projector, the stereo, disc players and set-top boxes and even the air conditioner. You can add multiple devices to QRemote and organize them by room so it can easily handle your home theater setup, the TVs in all the rooms at home, as well as the office projector and AC. The app is accessible from the lockscreen by tapping the Home key, which saves you a click when you want to use the G Pro as a remote. There's no QSlide version of the remote, but you can add it to the notification area. Overall, the LG Optimus G Pro can replace multiple remotes and media players (Android has apps for practically all the popular movie and TV show streaming services and the Play Store is one of them to begin with). The remote can be configured to launch automatically when the G Pro connects to your home Wi-Fi network. The last connectivity option worth noting is the 3.5mm audio jack on top of the Optimus G.
The LG Optimus G Pro features the standard Android browser (with some LG modifications on top), but also comes with Chrome preinstalled so you are given a choice right from the start. The standard browser offers the typical minimalist interface, with the address bar (used both for typing web addresses and initiating web searches) on top and a control bar at the bottom (with options hidden by default). Scrolling down moves the address bar out of view. The bottom control bar houses the back and forward keys, homepage shortcut as well as new window and bookmarks keys. You can hide that bar by dragging it down. One change in the Pro browser is the button just to the left of the address bar - it puts the browser into QSlide mode, turning it into a floating mini app. You can't switch between tabs in this mode, but the control bar at the bottom is still available. The web browser comes with Incognito mode, which enables you to surf the web without the browser keeping track of your history or storing cookies. A more minimalist UI is available from the Labs entry of your settings page. It hides most of the browser's user interface and gives you a quick five-button panel when you slide your finger inwards from the side of the screen. The browser can save pages for offline reading: they go in the Saved section of your bookmarks, and can be accessed even when you're no longer connected to the internet. The bookmark list shows a thumbnail of the bookmarked page and you also get a history section in addition to the Saved pages list. Find on page, always request desktop site and share page options are available from the advanced menu. If you tap and hold on some text you get the usual markers and select/copy/find/web search/share options. The Optimus G Pro supports double tap and pinch zoom. There's text reflow too - it adjusts the columns of text to fit the screen width. If you've pinched to zoom in, you need to double tap the screen to make the browser reflow the text. Text remains legible even at very low zoom levels thanks to the high pixel density. 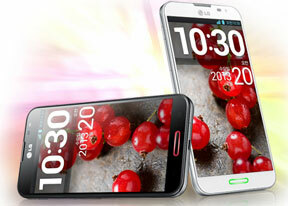 The powerful quad-core hardware enables the Optimus G browser to play 1080p Flash video without a hitch. But if Flash content is what you are after you will have to side-load the app as it's no longer available through the Play Store. We did so on our unit and everything worked trouble-free. Touch-optimized Flash plays trouble-free too. Chrome is also available on the Optimus G Pro out of the box. It doesn't support Flash or QSlide, but it will sync tabs (among other things) with the Chrome browser on your computer.